This article is about the royal title. For the community in the United States, see Khedive, Pennsylvania. For the hamlet in Canada, see Khedive, Saskatchewan. For the vessel, see HMS Khedive (D62). The term Khedive (Ottoman Turkish: خدیو‎ Hıdiv) is a title largely equivalent to the English word viceroy. It was first used, without official recognition, by Muhammad Ali Pasha (Turkish: Kavalalı Mehmet Ali Paşa, General Muhammad Ali of Kavala), the governor of Egypt and Sudan, and vassal of the Ottoman Empire. The initially self-declared title was officially recognized by the Ottoman government in 1867, and used subsequently by Ismail Pasha, and his dynastic successors until 1914. This title, known for its use by the Muhammad Ali Dynasty of Egypt and Sudan, is recorded in English since 1867, derived via the French khédive; based on the Turkish خدیو hıdiv which itself derived from the Persian خدیو khadīv ("lord"). from the compound khvat-data-, literally "created from oneself," from khvat- (from the Proto-Indo-European root swe-tos "from oneself," ablative of base s(w)e- ) and data- "created." Following the French invasion of Egypt in 1798 and Napoleon's defeat of Egyptian forces, which consisted largely of the ruling Mamluk military caste, the Ottoman Empire dispatched troops from Rumelia (the Balkan provinces of the Ottoman Empire) under the command of Muhammad Ali Pasha to restore the Empire's authority in what had hitherto been an Ottoman province. However, upon the French defeat and departure, Muhammad Ali seized control of the country, and declared himself ruler of Egypt, quickly consolidating an independent local powerbase. After repeated failed attempts to remove and kill him, in 1805, the Sublime Porte officially recognized Muhammad Ali as Pasha and Wāli (Governor) of Egypt. However, demonstrating his grander ambitions, he claimed for himself the higher title of Khedive (Viceroy), as did his successors, Abbas I, Sa'id I and Ibrahim Pasha. Abbas Hilmi Pasha, the last Khedive. 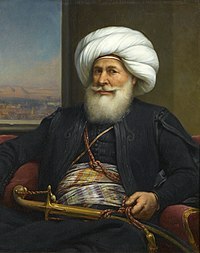 The Muhammad Ali dynasty’s use of the title Khedive was not sanctioned by the Ottoman Empire until 1867 when Sultan Abdülaziz officially recognized it as the title of Ismail Pasha. Moreover, the Porte accepted Ismail's alteration of the royal line of succession to go from father to son, rather than brother to brother, as was the tradition in the Ottoman Empire, and Arab dynasties. In May 1879, the British Empire and France began pressuring the Ottoman Sultan Abdülhamid II to depose Ismail Pasha, and this was done on June 26, 1879. The more pliable Tewfik Pasha, Ismail's son, was made his successor as the new Khedive. Ismail Pasha left Egypt and initially went into exile to Naples, but was eventually permitted by Sultan Abdülhamid II to retire to his Palace of Emirgan on the Bosphorus in Istanbul. There he remained, more or less a state prisoner, until his death. He was later buried in Cairo. After the nationalist Urabi Revolt of 1882, Britain invaded Egypt in support of Tewfik Pasha, and would continue to occupy and dominate the country for decades. During this period, the Muhammad Ali Dynasty under Tewfik Pasha and his son Abbas Hilmi Pasha continued to rule Egypt and Sudan using the title Khedive, whilst still under nominal (de jure) Ottoman sovereignty until 1914. With the outbreak of the First World War, Abbas Hilmi Pasha sided with the Ottoman Empire, which had joined the war on the side of the Central Powers, and was subsequently deposed by the British, who declared Egypt a protectorate (which means formally adding a territory to British sovereignty under a subordinate ruler) while he was on a visit to Vienna. His uncle Hussein Kamel was declared Sultan of Egypt by the British, who declared severance of the nominal ties of Egypt and Sudan to the Ottoman Empire (at least arguably invalid under international law, which did/does not allow acquisition of title to territory unless the existing sovereign, i.e., the Ottoman Empire, cedes it), and brought an end to the use of the title of Khedive. Hussein Kamel and later Fuad I issued a series of restrictive orders to strip Abbas Hilmi Pasha, their nephew, of property in Egypt and Sudan, and forbade contributions to him. These also barred Abbas Hilmi Pasha from entering Egyptian territory and stripped him of the right to sue in Egyptian courts. Abbas Hilmi Pasha finally accepted the new order of things and formally abdicated on May 12, 1931. He retired to Switzerland, where he died in Geneva on December 19, 1944. With "Article 17" of the Treaty of Lausanne in 1923, Turkey formally ceded (retroactive to 5 November 1914) all remaining claims and rights in Egypt and Sudan. ^ Historic photo of the Khedive Ismail Pasha Palace (Hıdiv İsmail Paşa Sarayı) which once stood in the Emirgan neighbourhood of Istanbul, on the European coast of the Bosphorus.